Alien crop circles have been a part of conspiracy theory folklore for a long time. Quite why an alien would come alllllllllll the way across the galaxy to little ol’ Earth, just to make a few circles in one of our staple food crops, I don’t know. But, apparently they do. Now, I know some of you are going to point out things like the suspicious presence of combine harvesters in the area of said circles, but I’m quite happy to believe that there may be more to them than meets the eye. Because, as you can see, I have positive proof that aliens have four legs, and appear related to Siberian huskies. Sure, its hard to believe. But what other possible explanation could there be? 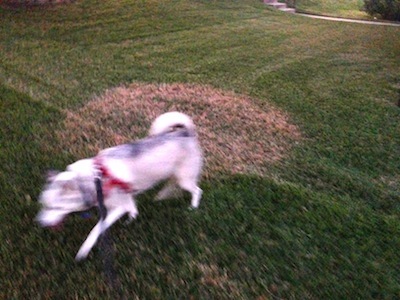 We have a few of those ‘crop circles’ in our back yard, curious round yellow splotches in the midst of green lawn. You’d think constant presence of dog would keep said aliens away. Mysterious, indeed. I believe you’re onto something there, Nigel! At our house, the crop circles are caused by Hubby’s innate belief that he’s capable of distributing fertilizer evenly without the use of a broadcasting spreader. I keep hoping the aliens will drop by and even things out a bit. Mystery of the ages SOLVED. I had no idea the aliens were so cute and so sweet looking.